I repotted my sago palm and it appears to be dying. All the fronds are yellowing. I trimmed the roots, which were in a ball, and planted it in Miracle Gro potting soil and lightly watered. I didn't water for another ten days or so. It is on a screened porch in NC with direct sun in late afternoon. I've had this palm abt 15 yrs and I love it. Can you help me? Some yellowing of the leaves can be very common. Inspect for any insects to rule that out. A regular schedule of fertilizer is important. I am concerned about the cutting of the roots though as most likely the cause of your plants stress. This is not generally recommended. 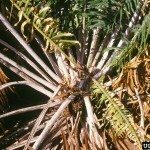 Potted Sago Palms are very slow growing and generally would not be be repotted to often, and then only going up a size. Good rich potting soil that is well draining is a must. Here is a link about proper care.